A 1961 Ford 100E Popular bought new at Donald Denoon Motors, Chelmsford. Homepage. This page: Order sheet, invoice and warranty for a 1961 100E Ford purchased in Essex. The history of a 100E. 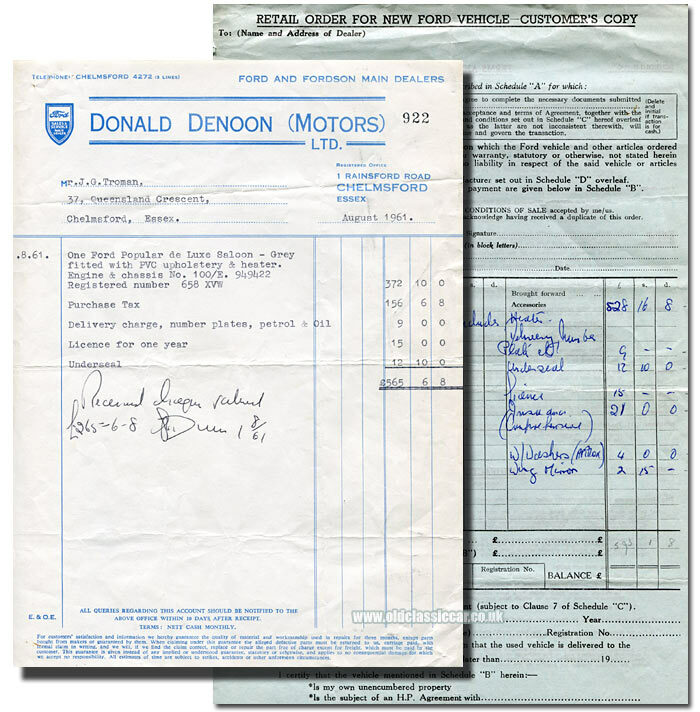 Some time ago a file of papers turned up, all relating to a brand new Ford 100E Popular, purchased new from Donald Denoon Motors Limited, of Chelmsford in Essex. Quite where I found these I don't recall, but it makes for an interesting time-capsule of documents relating to one particular car. A copy of the car's order sheet confirms that Mr John G. Troman, of 37 Queensland Crescent, Chelmsford, specified that his new Ford car should be finished in Regency Grey, with red upholstery, In addition to its (very) basic specification, this car was to be fitted with an optional heater, windscreen washers, and wing mirrors, after which a coating of underseal (costing £12 10s 0d) was to be brushed or sprayed on. Denoon Motors' invoice dates to August 1961, and describes the car's details - including its registration (658 XVW), and its engine and chassis number (100E 949422). The final purchase price was £565 6s 9d. The address of the dealership is given as 1 Rainsford Road, Chelmsford - now the location of an estate agent t'would appear. In addition to a compliments slip from the supplying dealer, there is also an original Ford Motor Company warranty which, when opened up, outlines the manufacturer's and purchaser's respective responsibilities with regard to any defects that might occur. 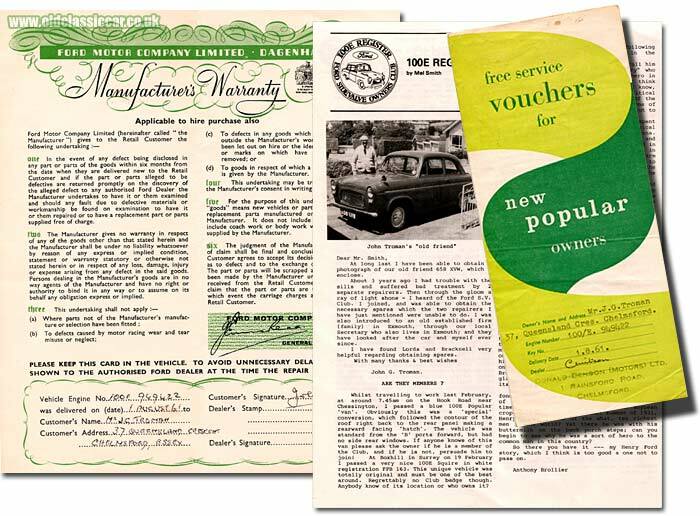 There is also a servicing leaflet which would originally have contained service vouchers for the new car. The first free service would take place at the 300 mile mark, with the next following on at 1,000 miles. These visits could take place at any authorised Ford establishment. If the car was being used overseas at the time of servicing, then the owner would have to pay the garage themselves, then claim back the funds from the supplying dealer, in this case Denoon Motors. It was recommended that a schedule of regular servicing work be agreed with the dealer, preferably every 1,000 miles. Each service would see the engine oil replaced, the chassis and running gear greased as required, a check of the levels in the steering box, rear axle, and gearbox, plus an inspection of hydraulic fluid levels in the brake and clutch master cylinders. The battery, tyre pressures, coolant and various linkages would also fall within the inspection. At the 5,000 mile mark, a more comprehensive service would be needed. This would see the lubricant in the axle and gearbox replaced, the springs sprayed with oil, wheel bearings adjusted, and a number of other precautionary checks made. Accompanying the old documents are a number of items that show Mr Troman joined the FSOC (Ford Sidevalve Owners' Club) in the early 1980s. The club magazine for June 1984 has a photograph of the proud long-term owner and his charge. By now, both he and his car lived at an address in Exmouth. Correspondence between club officials and Mr Troman discuss the availability of spare parts for the 100E. In a letter dating to January of 1984, the registrar provides a valuation of £400-£450 for the Ford. Did Mr Troman sell it shortly after? It would appear so, as an invoice for an MOT undertaken in 1988 refers to a Mr Brown as being the car's owner. What has become of 658 XVW in the intervening years? No Ford of this registration is revealed on a check of the DVLA database, nor does it seem that the number has been removed to be used as a private plate on another vehicle. Presumably it has been scrapped therefore, the only hope is that it rests in a shed somewhere, for some reason no longer registered. If the car is still out there, it'd be great to hear from the current owner. Enthusiasts of the Ford 100E Anglia, Popular and Prefect might find the pages of original b/w 100E photographs of interest.